Wouldn't it be great if you could tune into your local music like you do with the Last.fm radio? 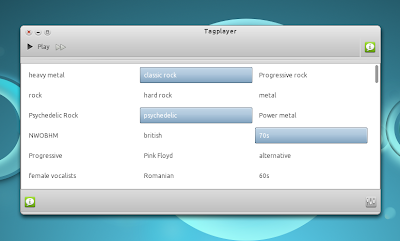 TagPlayer, a new Linux music player does just that: it plays your local music by using its Last.fm tags. The player is very simple and easy to use: select your music folder, enter your Last.fm username and password, select a tag (or more - hold down the Ctrl key to select more tags) and click play. That's basically where its feature list ends but there are a couple of thins worth mentioning: the songs you listen to are scrobbled to Last.fm; if you want to find out the currently playing song, click the info icon in the bottom left corner of TagPlayer's main window. Considering its purpose, you can't really say TagPlayer is missing any features, however it would be nice if it would get NotifyOSD notifications as well as an AppIndicator. But TagPlayer is very new (the first public version was released last week) so it might get these features soon. Alternatively, you can download the TagPlayer Ubuntu .deb (as well as the source code) from Launchpad (I've only tested it in Ubuntu 10.10 so I'm not sure if the .deb will work in older Ubuntu versions). TagPlayer is still in alpha so you may find bugs! Report them @ Launchpad.